Posted in News Media, Television. Tags: Chuck Todd, David Gregory, Jon Stewart, Meet the Press. RSS feed for comments on this post.. TrackBack URL. So I guess we know how the Bush regime has managed to keep the press in line and suppress the many stories of the President’s crimes against the Constitution and humanity from the mainstream audience for the last eight years. Feed ’em cake. It’s a shame Tom Brokaw could not continue with the moderating job; he has filled in nicely for Russert, and the show did not miss a beat and kept up its excellence. But, obviously, he’s more or less retired, and we cannot expect him to keep on going. Chuck Todd? Really? Mr. Todd is an analyst and a numbers cruncher, not the hard-hitting questioner a Sunday talk show needs. Maybe he has the “gravitas,” but his style could not hold up this type of show, as with Gregory. It’s a shame, really. For the forseeable future, “Meet the Press” will just be another political talk show. Chuck Todd is far more than a numbers cruncher. He appears to know far more about politics than most of the people at NBC, without being excluded as a good possibility by the biases displayed by many of the people at MSNBC. Besides being their top guy for analysis, he did an excellent job when hosting a hour on MSNBC during the day before the election. (I don’t know if he still has been doing this after the election). He might not have experience as a questioner, but I went for him with the hopes that quality in many areas suggests the capibility to do other similar jobs. I also don’t see anyone else at NBC who comes close. If they went outside of NBC then perhaps there would have been better candidates. 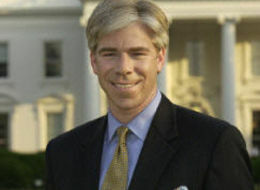 If we are going to knock Gregory for having cake with George Bush, it should also be noted that Bob Scheiffer has been a friend of the Bush family and George Stephanopoulos has his connections to the Clintons. The problem isn’t simply that Gregory had cake with Bush but that this would be cited as a reason for getting the job. For the most part Brokaw did a good job (as opposed to the terrible job he did moderating one of the debates) but I wouldn’t say the show “show did not miss a beat” under him. He did make one major error. One one show in which top aides to Obama and McCain were both interviewed Brokaw ended the show with a claim that polling shows that most people feel more secure with McCain as commander in chief. First of all, this was a low blow to bring out polling data as if it was fact, especially when he didn’t allow Obama’s person to respond. Secondly, his facts weren’t even right as he quoted older polling while more recent NBC polls showed that this had narrowed. I fear that Brokaw was giving his own opinion on the candidates and hiding behind old polling data. Well, Russert was not without his errors and his gotcha questions and his reliance on polls over substance sometimes, so I was just speaking generally. As for Chuck Todd as moderator of this show, I really don’t see him in that chair, but he is obviously a better choice for that chair for the reasons you outlined, and I don’t have MSNBC where I live to see Todd hosting an hour of television, but I’m sure he has excelled and is deserving of such a promotion. He just hasn’t been established at NBC long enough to be realistically considered. And I in no way said in my post that Bob Schieffer was any better than David Gregory when it comes to his journalistic relationship with the Bush regime; he is just as bad. I was just stating the obvious that Schieffer will benefit the most from NBC’s decision. It doesn’t mean I like him or his coozy back-scratching with the Bushes. He is part of the problem. And yeah, Brokaw was terrible in the debate. Brett, Journalistic quality and gravitas in the position are not necessarily the same. Russert certainly had his faults journalistically, but he also was able to keep MTP on top. While I thought he was the best choice among people currently at NBC, I didn’t think Chuck Todd would get the spot due to not having been there very long. Sometimes quality is more important than seniority and experience. The country made that decision last month in choosing a president. The comment on Schieffer wasn’t intended to attribute any views to you. I thought I should include it for the benefit of lurkers. If we were bringing up Gregory’s sharing birthday cake with Bush I thought this discussion should also acknowledge Schieffer’s relationship with the Bush family. At least Schieffer did do far better as debate moderator than Brokaw. He also did far better than Stephanopoulos and Gibson did when they moderated a debate during the primaries. « Does Size Matter (When Considering Freedom)?